Another Chandler, Arizona home interior design project! This 1986 master bath and master closet had to go. It was dysfunctional, out of date and not enough storage for my clients. My client’s design style is comfortable relaxed eclectic mix of traditional and transitional modern. My client’s color palette in this space was of soft blue greys, caramel, brown, cream, powder blue. We kept the plumbing layout the same location but highly improved the functionality. On the vanity wall we moved the right sink over about 6” to give my client more elbow room. We custom designed cabinetry to accommodate my clients desperate need for storage, ease of access and their tall heights. We incorporated pull out drawers for ease of access around the plumbing fixtures in the base cabinets. We added a pull out drawer for the trash receptacle and the scale and shelf cubby next to it for towels. Because my clients will stay in this home until they are passed we added blocking in the walls of the shower for grab bars down the road. We raised the shower head much higher to accommodate my client’s 6’5” stature and also raised the frameless glass surround height as well. 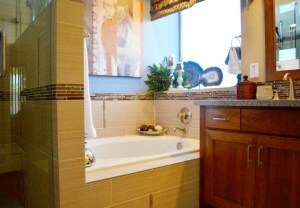 We added a floating bench for comfort and increased the size of the niches for the shampoos and soaps. We added an additional hand held shower head on a slide bar for function. 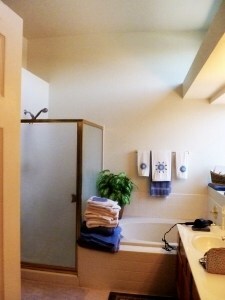 We moved the towel bar location and added new double towel bar where they could reach it. We kept the original tub and retiled the tub and shower surround with a large format porcelain tile with accents of listel tiles randomly placed and accent band of glass, stone and slate tile mosaic. On the floor we replaced the vinyl sheet with wood looking porcelain tile. 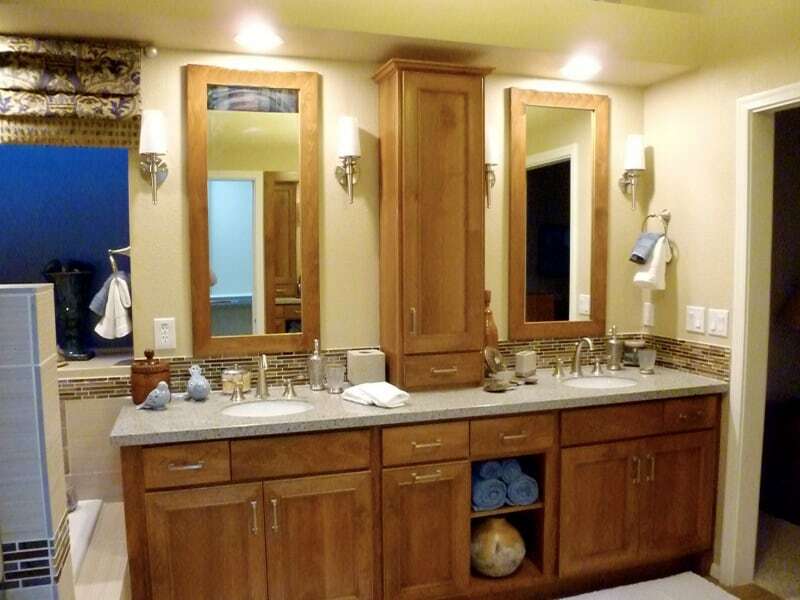 Since the vanity cabinet is taller than standard we kept things simple classic with under mount sinks and grey ecofriendly quartz countertop. We had the contractor remove a transom window above the entry door into the master bathroom from the master bedroom due to my client’s nightly work shift, cover the opening with drywall and finish it off. There was also a functional problem with the door swings of the bath entrance and the door swing of the water closet, they were butting against each other. 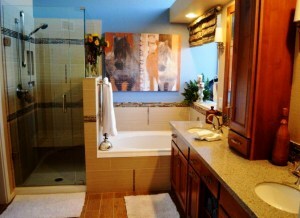 We simply replace the entrance bath door with a pocket door. In the master closet we totally changed out the builders’ grade and designed a closet storage system to fit my client’s belongings. 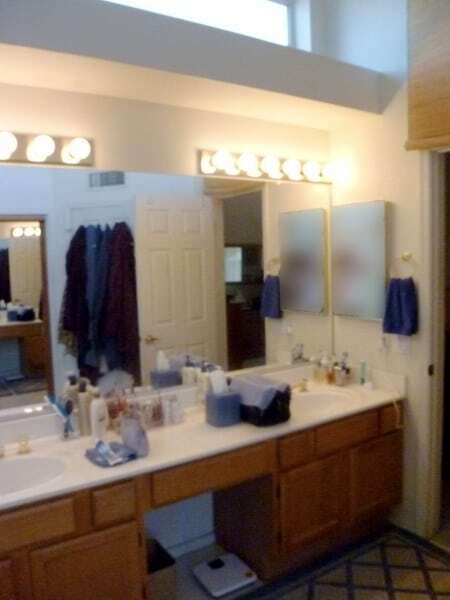 We also added additional ceiling light for improved viewing. We eliminated the builders’ grade mirrored sliding door and had the contractor install another pocket door entrance into the master closet. We had simple custom mirrors made for the vanity area and a full length for the wall right next to the closet entrance. We love to make a difference in our client’s lives by transforming their spaces into a functional, livable, soothing and happy retreat they so deserve.